Eric Carle’s Brown Bear Animal Parade is now available on the App Store in celebration the 50th anniversary of the much-loved classic picture book Brown Bear, Brown Bear, What Do You See?, the first of more than 70 books to be illustrated by Eric Carle. 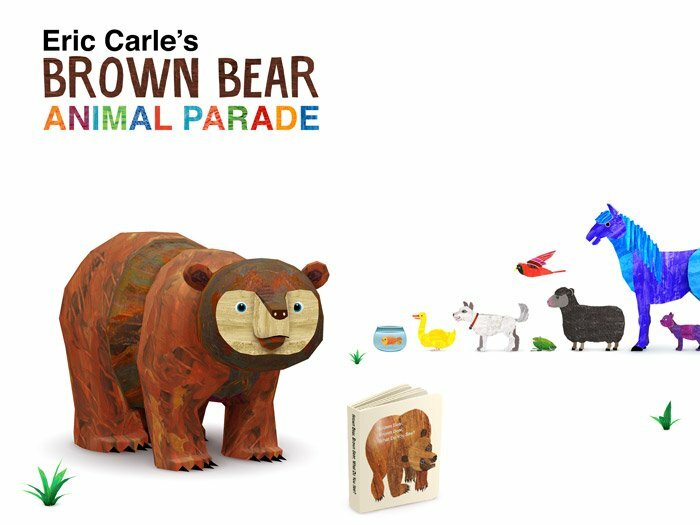 ‘Eric Carle’s Brown Bear Animal Parade’ brings Brown Bear and many other favourite characters to life for the first time in beautifully rendered 3D animation. Children interact with their very own lovable Bear, guiding him on his way as he explores a magical world of colour and music. As Brown Bear encounters new friends including Red Bird, Yellow Duck, Green Frog and more, the animals can be coloured with iconic Eric Carle collages. Each animal that joins Brown Bear on his journey brings its own unique instrumental sounds, with which children can experiment to form their own tunes in a beautiful musical parade. ‘Eric Carle’s Brown Bear Animal Parade’ both educates and entertains as young children engage with both art and music, exploring colours, shapes and basic collage while discovering musical notes. They have the freedom to create their own music and experiment with a variety of instrumental sounds. The app is perfect to be used in conjunction with the book to encourage reading and literacy as children actively engage with the story of Brown Bear in brand new ways. • Record your own animal sounds and create unique musical harmonies. ‘Eric Carle’s Brown Bear Animal Parade’ is available from the App Store for iPhone, iPad and iPod Touch for $2.99 / €2.99 / £2.29. Coming soon for Android.